Cambridge International Examinations is the world’s largest provider of international education programmes and qualifications for 5 to 19 year olds. Its main goal is giving access to the education at the world’s highest standards, supplying schools with educational curricula and a variety of services such us consulting, organisation of seminars and trainings for teachers, access to the supporting information that complements courses, etc. Cambridge programme of primary education is designed for children of 5-11 y.o., and is concentrated on the thorough studies of English, mathematics, and natural sciences. At the age of 11, children pass the examination and receive Cambridge Primaty Checkpoint certificate. Thus, starting from 5 y.o., all children in our kindergarden will be taught by the Cambridge programme, in addition to the national curriculum. The first two steps, Primary Checkpoint and Secondary 1, are in fact preliminary stages of passing, in ultimate perspective, Cambridge International A Level examinations. This diploma is recognised worldwide and is an exact equivalent of British high school diploma, and has the same value among universities and employers. Cambridge Secondary 1 programme is tailored for children of 11-14 y.o. and focuses on subjects as English language, mathematics, chemistry, biology and physics. At the end of this academic unit, pupils pass an examination and receive the certificate of Cambridge Secondary 1 Checkpoint. 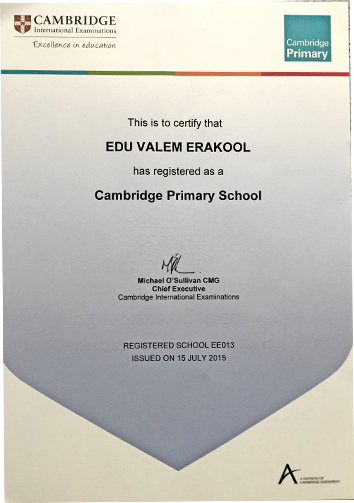 In future, Edu Valem plans to continue its collaboration with Cambridge organisation and will be allying for holding Cambridge international AS and A levels. Edu Valem gives a different education. You can find our school on the website of Cambridge centres here.